How to create visually animated and sticky blog posts! →How to create visually animated and sticky blog posts! We will see exactly how I animate images and other visuals, making my blog posts attractive to read. The effect of these animated objects on my blog has been a remarkable increase in average time on site. First, reload this page and take note the way this image (the screen shot) above loads. It has a zoom effect right? Secondly, mouse-over it. You'll have a Tooltip with text "Question from Emmanuel,one of my readers!" Thirdly, click it. Anytime you click the image, there will be a rotational effect. Three different animations have been added to that object. This content box is animated. I can add any text in here. I can even add images to it. Click the box to see the animation! The examples are just unlimited. The more you think of, the more you can get. But the question from many of you is How are these objects animated? How to animate blog post visuals! Let me start with the animated data elements I used above because those are quite simple to deal with. All you do is drag the element to your content area and add the data. Drag and drop each element to the position you want it to be. Once on your page, click it to edit the data. Note that these elements have inbuilt animation that cannot be changed. All you do is simply add data. Animated images and other objects! Now, let's see how you can animated images and other objects on your blog posts. Once you have your object dragged and dropped on your page, click it. Look for the Event Manager button. If this button is absent, that means you can animate the object. Under the Trigger tab, select the event that should trigger the animation. And under the Action tab, simply select Animation. You can play around with the different animations and select the option that's good for you. Click "Save Event" and that will be it. So you see with Thrive Content Builder, it's quite easy to animate your blog posts. Note that many other content builders allow this. First, buy it and setup on your blog. Tell your readers you've bought it. Link to it on your affiliate link. Do tutorial posts like this one and teach your readers how to use it. The this product converts quite well in the blogging niche. If you have bloggers reading your blog, chances are very high to sell copies. You get paid 50% per sale. That means for just 2 copies sold, you will get back your money. That's some sort of a refund that legally allows you the license. Time to act. Don't sit and complain. I have initially marvelled at it and wanted to ask the question. However, I noticed how you promote Thrive and I decided to check it out and found it was what you used. Yes, TCB is the awesome blogger. And I got back the money I spent to buy it through affiliate promotion. Is it possible to edit old posts or pages once you install Thrive? Or would I have to re-create them? I have a lot of plain looking posts that could use some livening up. TCB is a completely different editor. To deal with old posts, you will have to open the posts, copy the content and paste in the new TCB editor. Once done, you will have to then delete the content that’s within the traditional WP editor. OK, that makes sense. Thanks for taking the time to let me know how it works! Hi Enstine, this is so wonderful and looking pretty cool images with animated form. I want to use these but unfortunately I am not using wordpress. I have one query regarding this use of images with animated form. Any blog using images like in your blog, would it open slowly? Is there any way to use this style in Blogger? Can you help in finding online? Hi bro, the question on load speed is penitent but I haven’t noticed any change as a result of it. I’ve used all products from thrivethemes and I can say they’re very good. there also is thrive leads, thrive builder and thrive themes. it does work of autoresponder and other features. the animation part’s great. too bad its not available for blogger. Thanks for sharing your experience. You know with the content builder, you can create terrific landing pages. That’s a really cool plugin. Very helpful article and informative. I have not seen such beautiful animation on any other blogs. I’ll have to check this plugin out. Thanks for the comment my dear. Check it out and let’s see how it goes. If you buy, just let your readers know about it and they will surely buy from your recommendation and that of course will pay back your money. I never used Thrive content builder, after hearing from you hope will use. A part from blogging always you comes with touching content. This is really awesome, anyone can animated his content without knowing html5, CSS3, jquery or php. You will like it if you grab the plugin. Absolutely no technical knowledge required. Tutorials like this are great! I have this pkugin but don’t know how to use all of its features. Thanks for this! I hope you make more tutorials! I am very very happy to have read this articles. Though I have been noticing the animation but I was thinking they are gif image. Now Thrive Content Builder is really a good plugin to try out. Is there any free test to test the features before making any purchase? Wow, enstine, I normally follow your mail once it showed up on my gmail. Today’s own is not an exception. I saw it since yesterday and now I decided to open it. its wow. Good work and lots of things to learn ! Loved your way of explanation. Although I already knew that you use Thrive Content Builder to get such animation but just wanted to see which styles and examples you have shown here. BTW, just saw your homepage, it’s completely different and amazing too 😉 Congrats on the new look and design. You blog looks are just awesome Enstine. Really you have a great knowledge. Thanks for sharing it with us. That’s really cool Enstine. All of your blog post’s looks are just incredible. I picked this up on your referral and am really happy with it. I’ve only had it a few days, still playing around with it. I can say, it’s pretty simple/intuitive to use, and it makes a really professional presentation. The animation aspect is fun and very impressive, but there’s lots of other really, really great things you can do with this awesome plugin. Thanks so much for recommending and demonstrating. I know this will be a great addition to my blog and my online business in general. Yes I got the $48.50 commission from your order and thank you very much. I remember David shot me a question on Facebook which I responded. You know, I mentioned in the beginning that this is one of the best additions to my blog this year and I maintain what I said. You can’t be wrong having it on. This is a fantastic post. Already i saw many blogs with animated and sticky blog posts, but i didn’t know the trick behind that posts. I just saw your post and it cleared all my doubts. Thanks Enstine for sharing the secret. Congratulations for creating such a helpful post for us. It’s pretty simple to implement. Nowadays, digital marketers and bloggers are rushing towards engagement. Engagement is one of the deciding factors for Google search results. When we talk about engagement, animation is really helpful to keep your audience stick to your screen. thanks for sharing this,i have known this now only.These days people are preferring these kind of stuff because they are expecting something unique from regular one. You are great, Enstine! Your information is really precise. Having a animated visual blog is big help to show your company service to the customer at the same time it attractive especially you are creatively excellent. Another great post indeed.Here you told us how to create a visually animated blog post.Here you told us about a plugin that is content thrive builder. It is a plugin of lot of qualities.It makes your post more attractive and more visually animated.Here you told some its benefits and its uses and its different packages. I love creating animated video for marketing but my problem is it takes months to finish one of video because the only reason is I had really fuzzy vision of what kind of theme for video to make look much more attractive when I present. 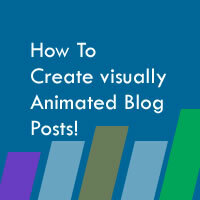 Nevertheless, thank you for creating this article of how to create fine visual animated blog post. Keep posting, Enstine, you are really great! Creating an animated visual is definitely difficult but fortunately, this article has the significant statistics on how to create on easy way. Excellent tutorial, Enstine!